DVD/Video player. Is optimized for comfortable review of films. This program is freeware. If you transfer me the small sum, it very much will help to further development of the program. Or to convert with E-Gold on WebMoney here, on a purse Z029394435956. 99 % of commands player is executed by one click of the mouse! The menu occur at prompting the mouse on an appropriate tag player. It is not necessary to press mouse buttons. Also all tags player are active, i.e. they execute the basic operation of that menu, which occurs, and you should not move on the menu, and it is less than movements, that is you will test true enjoying from review of film. You will be not distracted by management player. The response of some tags can be adjusted at own discretion. 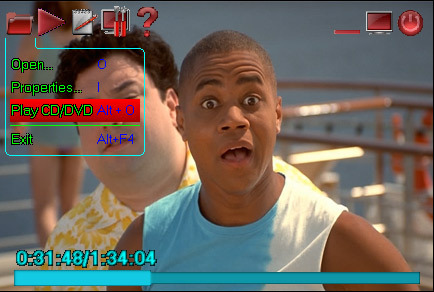 The menu player does not close picture of film - it simply transparent. And it means, that you will not spoil to yourselves pleasure from review of film, even if you need something to select from the menu player. Fast increase of a picture and instant panning. By one easy movement of the mouse you can increase a picture of film. Or to remove black bars from above and from below of film, if he has the wide-screen format. Opens playlists standard VideoCD (*.mls) and most popular players. Search of a video on CD and DVD, his playback, and clever definition of the name of film. It means, that for review DVD or CD, it is enough to you to press only one button or to select the appropriate choice, and in both variants it is the same button (or choice). At start player will try to find on it CD the normal name of this film, for example "Matrix", instead of VideoOut.avi. You were got by advertising on DVD! - passing of advertising and pictures. And it, when at the beginning of review to you push from one about three minutes of advertising (usually what advertising be player). At activation of the given function, you will be saved of this lack DVD. And for you remain excellent moods for review of film. You very much would like at start DVD to look film, instead of the initial menu, where is necessary to press the "play" button! - passing of initial menus at review DVD. Almost as well as previous variant, only this case, you force to do superfluous bodies - movements to press only one button, which it was possible quite to do without. But now for you it too not a problem! Since Windows 2000, in standard dialog boxes Open File dialog the new element - panel of addresses (Place bar) has appeared, the employee for a fast choice of the most popular and important folders, as the Journal, my documents etc. you can replace any folder, for example in which keep all your films, and this (these) folders will be accessible from any application. Remembers items of review at one time of overlooked film. Does not depend on the name of film, site, renaming and his moving. The name and path to film is not saved anywhere. And how many you are unimportant of films looked, player will remember each film. Three modes of shutdown of the computer. Each are made active by one pressing of the mouse. From you a minimum effort, to what seems like cinema.